To Ron Dauzet, it’s a collection of more than 200 cars—some common, some rare, everything from old BMWs and Mercedes-Benzes to MGs and Jeeps and Porsches. But to the Michigan township he lives in, it’s an unlicensed junkyard, an eyesore, and the cars must go. But Ron fears they must go at a quicker rate than he, or anyone else, can possibly manage. 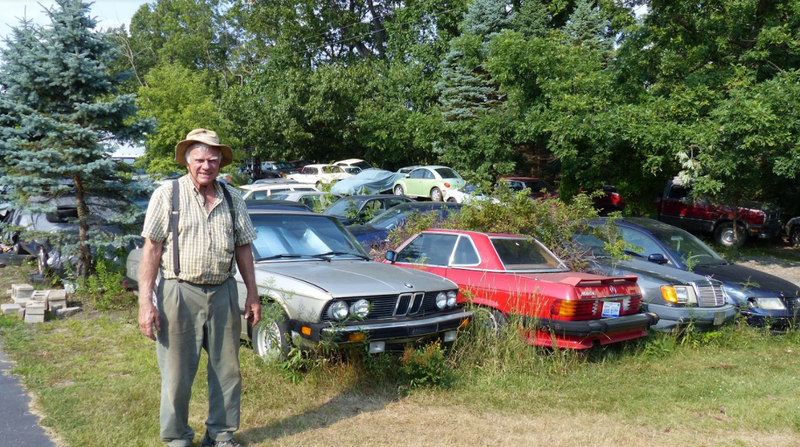 Ron, 74, is being forced to sell off his enormous car collection at a rate of 20 cars per month because of a township ordinance banning the storage of unregistered vehicles outdoors. And he is utterly overwhelmed. I first learned about Ron Dauzet from an internet forum member who drove to Northfield Township, Michigan—located between Ann Arbor and Brighton—to buy a Mazda Miata he had spotted on Craigslist. What the prospective buyer ended up finding was much more than just one little Japanese roadster: it was a giant field filled with scores of old, mostly-European, mostly quirky enthusiast cars. He had, at one point in June, 218 cars on his property. After seeing photos of the cars on the forum, I went to one of the owner’s many, many Craigslist postings, copied his phone number, and dialed. The voice on the other side was that of a cheery, upbeat older gentleman who told me he was a huge car enthusiast who had been buying up cool cars since he was 21, but that he was now being forced to part with them. Ron is selling this 1986 VW Scirocco for $800 on Craigslist. Despite his cheery initial greeting, Ron’s tone became somber as he told me that he, at the age of 74, has been working all day, seven days a week to keep up with the township’s quota—a quota which a representative from the township checks up on once a month by visiting Ron’s property. The ordinance prohibits the storage of unlicensed cars outdoors, even on someone’s own property. The township has an ordinance that deals with unlicensed cars. They often contribute to blight...Most municipalities have such ordinances also. There is no problem if the cars are licensed or housed inside a building...I hope you can help him find new homes for some of the cars. I learned more about the situation after Ron sent me a copy of a court document from the Washtenaw County District Court. That file claims that Ron has a total of 218 inoperable vehicles on his land, and that those cars violate section 10-19 of the township’s code of ordinances. It is for these many reasons that the township took Ron to court for storing unlicensed cars on his own property, and it is for these reasons that the court issued a judgement requiring Ron to reduce the number of inoperable vehicles stored outdoors. Ron digging through his buckets of keys for one that fits into a VW he’s trying to sell. Ron said the township initially wanted him to rid of his cars at a rate of 25 vehicles per month. But selling “damn near one [car] a day,” was impossible, so Ron proposed 15 vehicles a month instead. Ron claims the attorney told him the township would never settle for that, and thus Ron “had to compromise at 20.” He still finds that figure far too high. It turns out, the VW was missing significant engine parts; the buyer ended up purchasing only the seats. So now Ron is facing the daunting task of selling 20 mostly non-running cars a month, and if he can’t meet that quota, there will be consequences. The document says failure to remove cars fast enough means Ron “shall be compelled to immediately bring the property into compliance...by immediately removing all of the remaining vehicles from the property.” In other words, if he can’t hit the 20 cars per month mark, the township could seize all of his vehicles, leaving him out all of the money he could make selling them. It’s worth noting that they haven’t acted yet, despite Ron failing to meet the quota. Clearly, the Township isn’t playing around. They want these cars gone. But Is It Really A Blight Issue? Ron admits that his collection has gotten out of hand over the years. Most of the cars on the lot, he says, got there since he moved to this house 15 years ago. And he’s really not that upset about parting ways with his vehicles. After all, he’s getting older, and doesn’t want to leave his wife all those vehicles with which she’ll have no clue what to do. “I’m gonna have to get rid of them sooner or later...it was getting out of hand,” Ron told me. But what Ron is upset about is being forced to sell off his cars under terms other than his own, because according to Ron, the vehicles are out of sight. Ron owns the property across the street from him, and his closest neighbor can’t even see his yard through the trees, so Ron is confused that township stepped in. So I stopped by Ron’s property to have a look, and he’s got a point. Aside from the opening to his driveway (see picture above), it’s difficult to notice Ron’s collection while driving down the rural gravel road he lives on. The photo above shows that rural gravel road; his property is on the left and right. On the left side, where most of the cars are housed, is a high dirt mound and trees blocking the view. Where the dirt mound isn’t so high, if you look closely enough, you can see the outlines of some cars through the vegetation —and during the winter, when the bushes have lost their leaves, the collection might become a bit more prominent. But again, this is on a gravel back road with little traffic flow. Ron also owns the lot across the street. If you look carefully while driving by, you can spot a couple of cars through the fence, but by and large, like his other property on the other side of the road, the vehicles are hidden from view by shrubs. I don’t live there, so I can’t say for sure that the car collection (which I understand some might not find “aesthetically pleasing”) is completely out of sight of neighbors. But after stopping by the property a few times, I have to say that—considering how remote Ron’s property is—I really didn’t see Ron’s collection as a “blight” concern whatsoever. Upon entering Ron’s property, I saw cars everywhere. Old BMWs, diesel Volkswagens, Audis, Saabs—tons of quirky European cars, and very little boring stuff. I spotted Ron standing in the back corner near his house negotiation the price of a Cadillac Allante. After some heavy haggling, the two agreed on about two grand (the man never returned, Ron told me), and Ron then showed me around his panoply of automotive wonders. It was incredible. Here’s a sweet Beetle next to a beautiful fourth-generation Mercedes SL. Ron’s got an incredible assortment of really weird cars. Lots of diesels. Lots of wagons. Lots of manuals. Lots of turbos. All different kinds of engine and drivetrain layouts. The man just loves quirky cars (and can tell you anything you ever wanted to know about them), which is why he’s spent all this time gathering these things. But while Ron admits that he should probably get rid of his cars (many of which have withered away over the years), he says he just wants more time. The Day And A Half Per Car requirement just isn’t feasible, with Ron telling me over the phone “It takes that long to get the car out of storage,” especially when his fork lift gets stuck anytime it rains. (It’s worth reiterating that the court document specifically mentions weather and “difficulty in accessing the vehicles” as two unacceptable excuses). He recently had to break the window of one of his cars to get inside, as there wasn’t enough time for him to find or make a new key. As someone with arthritis, asthma and four previous bouts of cancer—and nobody to help him get the cars out of their spots—Ron says he simply cannot get rid of a car every day and a half. He’s in way over his head with the township’s quota, telling me “I don’t sleep at night,” and saying he’s concerned about a car falling on him, or that he’ll have a heart attack from all the stress. And that’s one of Ron’s biggest concerns. He says he’s being tasked with dispatching a car collection at the same rate as someone might be expected to scrap a bunch of junkers. But Ron doesn’t want to scrap some of these priceless gems (he admits that he has scrapped some, but ends up making only a couple of hundred dollars because he has to pay the scrapyard to pick up the cars). Instead, he wants to sell them off to a good home at a reasonable price—and that takes time. As someone’s who’s working from 10 to 5 every day to sell off 20 cars per month, Ron is worried about his health and his bottom line. Rushing to get rid of so many cars—especially at his age—is stressful, and trying to sell the cars so quickly means he’s forced to offload his collection for far too cheap. It’s worth noting that, this ordinance isn’t specific to Northfield Township, and according to Lemon Law attorney and auto journalist Steve Lehto, there’s a good chance the ordinance is just a standard one that the township adopted at some point as a “uniform” ordinance. Still, the township is actually enforcing it, and that’s putting Ron in a bind. A little bit of legal help could have saved Ron a lot of hassle. I understand the township’s concerns here. But I fall on the side of “let the man live.” For local government to tell Ron he can’t collect cars out of sight on his own property unless he spends possibly tens of thousands of dollars either registering those cars or building garages to house them is absurd. I mean, hoarding cars is the American dream, one that I myself have been living to the fullest. In the meantime, it doesn’t matter if it’s a collection or a junkyard; it has to go, and Ron’s got a lot of work to do. You can see the driveway of Ron’s nearest neighbor on the left side of the gravel road. Trees block direct line of sight. Ron also has some cars stored indoors. A Mercedes 300D is in there somewhere. If Someone Wants To Collect Cars On Their Own Property (And Out Of Sight), Let Them.